Heat grill. In pint jar with tight-fitting lid, combine all basting oil ingredients. Shake vigorously to blend. Place vegetables in 15x10x1-inch baking pan. Pour basting oil over vegetables, stir to coat. When ready to barbecue, place vegetables, cut side down, on gas grill over medium-low heat or on charcoal grill 4 to 6 inches from medium-high coals. Cook 14 to 18 minutes or until crisp-tender, turning once and brushing with basting oil to keep surfaces moist. (Cooking time will vary according to size of vegetables.) Cut vegetables into bite-size pieces. We have included an assortment of colorful vegetables, but you can add or subtract to satisfy personal tastes. 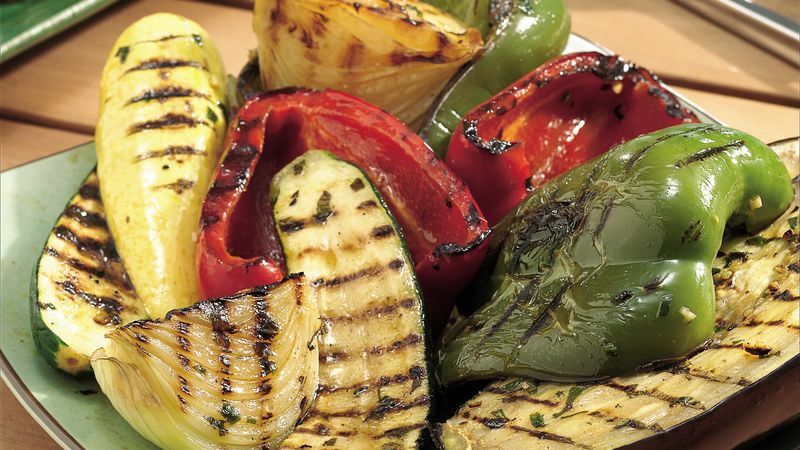 Cutting the vegetables into smaller pieces can decrease the grill time. Onion quarters can be grilled on skewers to prevent them from separating. Place vegetables on broiler pan; broil 4 to 6 inches from heat for 18 to 22 minutes or until vegetables are crisp-tender, turning once and brushing with basting oil.